This week, Nike announced Colin Kaepernick, the former San Francisco 49ers’ quarterback who became political lightning rod when he began kneeling during the National Anthem to protest against police brutality, is one of the faces for its new “Just Do It” campaign. 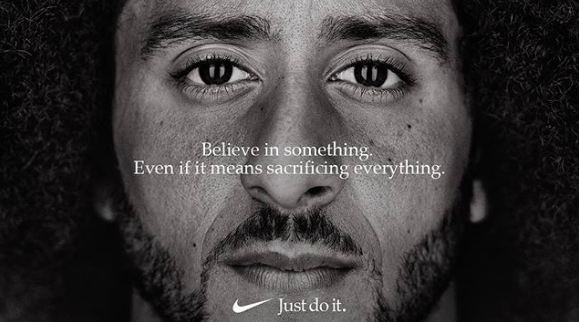 As part of the campaign, Kaepernick shared a meme on Instagram featuring his portrait along with the tagline “Believe in something. Even if it means sacrificing everything” and Nike’s “Just Do It” logo. Not surprisingly, Trump supporters, white supremacists, and other deplorables weren’t too happy about the ad. In response, many started burning their tennis shoes and ripping apart their workout clothes in protest. Now, they’ve taken it up a notch by creating their own racist, misogynistic, and transphobic memes mocking Kaepernick and his message and gleefully sharing them on social media. Honestly, we wouldn’t expect anything less from Trump’s basket of deplorables. He shouldn’t have knelt during the National Anthem. It’s not a song praising Trump, it’s a song praising the USA, his country. By insulting the song he’s insulting the people as well. I feel the same way about flag burning. It is absolutely his right to do what he did, but now he’s got to face the repercussions. THANK YOU. Finally. Freakin’ Queerty editors are so horny for kaepernick, and naturally, their logic is that to disagree with him is tantamount to supporting white supremacy. Since when are you obliged to be patriotic? @HaugePeter – Since you’re effectively acting as an employee on the field and not a private citizen. Is he there for free? Volunteering? Nope. Keep politics out of the game. You don’t want to stand – that’s cool, then don’t go out on the field. Come out after the anthem. But I tend to find that the people whining about the United States are the very same people that haven’t lived in any other country. He shouldn’t kneel during the national anthem? A song that was originally racist, until it was decided to drop the second verse? He didn’t insult the anthem. Kneeling is a sign of respect. You kneel before a king. You kneel before you pray. A veteran was the one who suggested that he kneel. And for the last time, this isn’t about the anthem or the flag. Do you think Rosa Parks was protesting the bus? Also, until recently atheletes stayed in the lockerroom while the anthem was playing, and I don’t see them refusing to play so I don’t see how this is a problem because they are employed by the NFL. Enough with the forced patriotism already. If you want that, move to North Korea. first the star spankled banner was never meant to be the US Anthem or song but just a poem. Blacks have fought for this country even in the war of 1814 without their rights and due respect, so being a patriot has nothing to do with civil rights, you can certainly ask any person of color who served in the uniform. It doesn’t protect you from racist. My dad was a Marine, and he will tell you the same. A white Green Beret told Colin Kaepernick to take a knee to show respect to the military, which is what they do to honor the fallen. A lot of military vets support what Colin is doing. So the right to protest is protected by the constitution, to say that someone should not exercise their right when they have a Just reason to do so is so damn ridiculous it’s not even funny. Read a book and learn your history, stop saying stupid things, and being a distraction to the topic at hand which is civil rights and justice. Otherwise all you are doing is furthering the white nationalist agenda. @Godabed, great points. Actually, the first person to give his life for what would become the United States was a BLACK MAN, Crispus Attucks, in 1770, making him the first person killed in the Boston Massacre,and thus the American Revolution. Black people fought in that war, in other early American wars, in the War of 1812, in the US Civil War, and on and on, for a country that did not recognize their humanity or their full citizenship. This was true during World War 2, when Black soldiers fought against white supremacist fascists in Germany, who were treated better as prisoners of war than they were! Sports have ALWAYS been political; Colin Kaepernick joins a long line of activists who have excelled on the field but also called attention to political and social issues they and others faced. He isn’t the first, and he won’t be the last. @SnakeyJ – that’s what angry white people said about Martin Luther King’s peaceful protests. The “repercussion” for him was the loss of his life. By wanting – and forcing the country – to live up to its creed, somehow that is insulting to people who really don’t have to worry about it. Get all offended over the protester’s peaceful, and lawful, protest and never once come any where near attempting to understand the conditions causing the protest. Classic. I really hope that you understand that his kneeling wasn’t to be disrespectful to his country. His kneeling was to highlight that his experience as a black man in America is not the same as white Americans. The lyrics in the anathem aren’t applied to all Americans. If we were promised a 100% (tax free) home in the hamptons for standing in the freezing rain all day, most of us would do it. If from your experience you were aware only certain people were actually given the home based on appearance, that you didn’t possess, I doubt you’d waste your time in the rain. The anthem is just a dreary song, the flag is a rag on the stick, and ‘the people’, in much as such as the concept is anything other than abstract BS, are, by and large, a bunch of complacent halfwits that sorely deserve to be insulted. Stop being wilfully obtuse. The form of his protest was never about the flag or the anthem. It was a form of orderly and peaceful protest, and every American has the right to peacefully protest at any time and at any place of their choosing, so long as they do not violate the law in the process. So stop with the intellectual dishonesty. Stop bitching about veterans and the troops when that was never the point of the protest. You’re just too uncomfortable dealing with the fact that we live in a tiered society where we are taught to be angry at and afraid of black men, and that SHOCKINGLY means that they consistently receive poorer outcomes when encountering law enforcement and the justice system at large. This was never about the flag, the troops, or the anthem. You’re just gullible enough to swallow that line. It amuses me how trolls come out with deliberate or ignorant comments concerning this issue. SnakeyJ is a droob. Jboo – so you have confused the symbols representing the ideals of the United States with the ideals themselves. A common event among the ignorant who elevate the symbol to some magical element and feel anyone who disagrees is somehow attacking them because of their obsession with the symbol. The National Anthem has no value nor does the flag have value unless the principles stated in the constitution are respected. One of those ideas is that one can express his opinion and seek redress for wrongs. BTW my experience is people like you have no clue what the Constitution says nor the comments of the Founders concerning the rights enshrined in it. As for your comments about living overseas, I was born and raised in a Navy family and as a child lived overseas. I did my own government service and was sent overseas. Since then I have traveled and worked in a number of places in Latin America, Europe, and the Pacific. I am proud of my country but I am not blind to its faults and love it enough to wish to see it live up to its full potential. You apparently do not. @Juango. LOL – It’s called constitutional limitations. You do realize there are limits, right? As in the right to free speech doesn’t entitle you to say whatever you want? Do you also realize that equal protection only applies to state action? Do you even know what state action is? Typical leftist psycho-babble. Cowards like kaepernick haven’t fought for the country. And for every veteran that supports him, there are other veterans who don’t. That’s such a stupid argument to fall back on. But of course, the opposing veterans don’t matter, right? Because when BLM wants to burn the American flag it’s legitimate protest – but if you burn sneakers, you’re a white supremacist, right? Why aren’t you out defending the people’s right to protest kaepernick? It’s protest and free speech after all. Oh wait – because only CERTAIN free speech is allowed in your opinion. Sneaky J, your comparison to Kapernick’s kneeling to flag burning doesn’t even come close to what the issue is. People applauded Kim Davis in Ky for refusing to do her job. The one to which she took an oath to do, but yet we want to condem Kapernick for speaking his mind. I don’t know if you are black or white, but until you walk a mile in my shoes as a black man, you will never understand the protest. One thing his protest did, was to get the conversation going, because whether you and some others who have posted some wild remarks like it or not, since Trump has been in office, racist attitudes, comments, and actions have hit an all time high. What you are over looking SnakeyJ, is that when you can face repercussions for doing what’s right, you’ve done more than just something. A job I worked on, I was fired for trying to organize a union. I got fired. 10 years later the very thing I faced repercussions for is now in place and the conditions that the workers once had to endure are no more. Then why play the National Anthem at all? A football game is not a governmental event, nor a call to arms. How does kneeling in silent reflection insult the national anthem? He didn’t shout, wave his fists, or do anything more than kneel quietly. He didn’t disturb anyone. Kaepernick acted out of a sense of justice and did so quietly and dignified. He harmed no one. If you patriotism can’t take a little push now and then, then you aren’t really all that patriotic. The only reason this whole mishegas is still a thing is the biggest scoundrel of them all got elected President and he needs to keep people distracted from the disaster that is his White House. It is definitely his right to protest by kneeling down but at the end of the day, what has it achieved? Just more controversy and more polarization. Now if you think polarization is good for this country, continue to do what he does. What is the goal really? Just getting people to talk incessantly about the controversy? MacAdvisor. Repeat after me. NATIONAL. Anthem. Not Republican anthem. Not Democratic anthem. NATIONAL. As in it represents all Americans. And if “my patriotism can’t take a little push”? So if I disagree, then I’m not patriotic, but if someone acts utterly disrespectful, they’re a legitimate political activist? Leftist logic at work there. I love how you characterize his disrespect as ‘just’ and ‘dignified’, and then in the same breath refer to a democratically elected president as a scoundrel. JBoo, I am not sure being democratically elected makes President Trump any less of an scoundrel. He is also an ignorant buffoon, yet still democratically elected. President Trump is absolute proof democracies get things wrong sometimes. I understand our national anthem is meant to be non-political, but what does it have to do with a football game? Football is not part of our national government. It isn’t the arrival of an ambassador or the arrival of a flag-drapped coffin at the airport. Football is a sport used to entertain us. If one side can use it to inflate super-patriotism, another can use it to bring attention to injustice. I don’t see the man standing with his hand over his heart as any more patriotic than the one kneeling quietly. StraightnNarrow: what is achieved at the end of the day by a ACT-UP protest? Oh, yes, patients were eventually able to gain access to live saving drugs. What is achieved by staying seated at the bus and starting this whole bus boycott thing? Oh, yes, the integration of public buses. You tell me what is achieved by standing silent with one’s hand over one’s heart? @Straightnnarrow – gosh the American Civil War was so polarizing. If only they’d stayed home… It saddens me when Americans are afraid of protest – even peaceful, respectful protest – when this and most modern nations were founded on that very principle. ChiChiMan: of course Trump was democratically elected. We don’t operate as a direct democracy, true, and he did not win the popular vote, true, but he won using our system exactly as it works. The House certified Trump’s selection as President without a full objection (one House member, Maxine Waters, did object, but failed to get a Senator to join her). Trump won according to our own rules. As for Russian meddling, they did not change vote totals, no one has suggest such, but they ran ads that were against the law, but, ultimately, the fools who believed those ads and voted accordingly are the ones that betrayed us. As a democracy, the people need to be better at judging the truth if a simple ad on FaceBook convinces one to vote for a clear buffoon like Trump. In the eyes of other democratic nations, we do not have democratic elections, and the frequency with which people become president of the US without a majority of the popular vote shows that to be true. The electoral college system (much like the 2nd amendment) comes from a time very different than the 21st century. Perhaps it is time to join the directly democratic countries and have actually popular elections, make voting easy and required, and severely limit the time and money spent on campaigns. We would then be seen as an actual functioning democracy by the rest of the developed world, and we would have elections that focus on issues not images and are treated substantively in the press, not as a poker tournament! @MacAdvisor – You’re making my arguments for me, my friend. You’re correct – the flag is not supposed to be political – so why then is kaepernick incorporating a political protest? (And LOL – yes, because everytime the national anthem is played, CLEARLY this is a call to arms, there cannot POSSIBLY be any other reason to play it, and every nation which plays their respective anthem obviously emulates and embodies your logic) Would you tolerate that from the teller at your bank? The person who bags your groceries? From a teacher at a school? I don’t think so. Protest all you want – in the appropriate forum. That’s all anybody is asking. But naturally, SJW’s feel they’re entitled to do whatever they want, wherever they want. Hate to break this to you bub, but neither political candidate in the last presidential election was a stellar candidate. If Trump is a scoundrel, Clinton was pure trash. If your quasi-logic can’t take a little push now and then, then you aren’t really all that intelligent. No one is forcing patriotism. People can do what they want to do to protest. But there has been a backlash and it is not from white supremacists and bigots. It’s from regular Americans from all over the US who are actually proud of living there. NFL TV ratings are down, and so is revenue and that’s a direct result of these protests, so if nothing else, it might be finances that will force the athletes to get back up and stand. And @Franklin, it’s insulting because tradition is that someone stands during the National Anthem, so kneeling is a show of disrespect. Of course I’m not including those who can’t stand or have other issues preventing them from standing. It’s from American’s who choose to ignore what going on with other Amercan’s. That’s why this protest was needed. Let’s be real though, no form of protest is really acceptable for some people. You say from “regular Americans,” who just happen mostly to be white people who don’t even try to understand why he and others are protesting, or do anything to help address the problems he may be trying to call attention to. OK, so let me ask you, have you ever dealt with a hostile cop or cops? Has anyone in your family or friend network been harassed by cops or shot to death? Have you ever participated in a protest or rally to call attention to police violence and murder of unarmed black people or other people of color? What was the last protest on behalf of equality and fairness under the law that you participated in? You are trying to force Kaepernick and others to buy into one version of patriotism, when real patriotism is honoring the ideals which this country allegedly stands for, which include the freedom to dissent, to protest and to peaceably assembly. @Kangol: The topic of police violence can’t be fully discussed here, but there is a lot of data out there, and if reviewed will show the truth is more nuanced. Just saying more blacks than whites are killed by police doesn’t take other facts into account such as: were they armed or unarmed? Why were they being stopped? Was there resistance? Also remember that not all the black victims of police shootings were shot by white officers. Many were shot by black officers or Latino etc. It is not from “regular Americans”, but from those easily enough manipulated to conflate a mild quiet protest with “disrespect for our troops”, which is what most of them refer to. God help us if “regular Americans” are no longer able to think critically and avoid manipulation by autocrats! The inequitable treatment of people of color that he was protesting, and which continues with other players protesting is real and documented by actual statistics as well as anecdotes of the most extreme incidents in the media. I have a manager at work who understands that every time he takes his little sports car out he is likely to be pulled over by the police. Who knows from experience that if he calls 911 to report an incident in his neighborhood he is going to be treated with suspicion by the police in a way most of his friends are not. His parents had to make sure he understood that any interaction with police was dangerous to him, regardless of the circumstance. He is retired military, and he understands why players kneel. You need to as well rather than being a prig. If you value “tradition” over thinking about and dealing with real issues, I pity you. And if “pride in living here” is based on the random nature of birth and there is no interest in understanding or realizing the stated ideals of the founders, you are further pitied. Your intellectual dullness is horrifying. All those things have, in fact been taken into account and studied. As has the sentencing of people of different races for the same crimes (and adjusted to take priors or lack thereof into account). You are wrong. ANY black man or woman can tell you that black people are stopped more often for no reason, or followed by security for no reason. Any black person can also tell you that they have a higher level of anxiety regarding interaction with law enforcement than white people do. Perhaps you think that is a good thing, and if so you need to examine that. @dwes09: If your manager’s parents “… had to make sure he understood that any interaction with police was dangerous,” then they really made his suspicious of police from a young age. That’s a problem. Your examples are anecdotal rather than based on fact. Go online and look at facts. Kneel, stand, sit, doesn’t matter to me. As far as Nike, I never buy their overpriced poorly made crap anyway. If the brand stands or falls doesn’t matter to me. Love how triggered statists get when the sanctity of their weird flag-cult is even slightly questioned. The Trumpanzees are such low life, loathsome horrible ugly soul people. They’re rude ,crude, lewd and screwed. Just like their “leader”. Just wait til the economy goes off a cliff-they’ll still support him and sacrifice themselves on the altar of political stupidity. These people are so desperate. They’re making Nike MILLIONS, giving Nike tons of free publicity and POLLUTING the environment: most mass made shoes contain toxic materials. And the Orange Dumps lemmings are being led down a dead end road. They’re full out Neo-Nazi fascists ! !